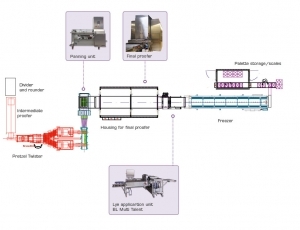 The lye application units all have 4 lye curtains which can be set up individually. To aid cleaning, the lye reservoir and the assembly containing waterfall and conveyor belts can be completely dismantled. 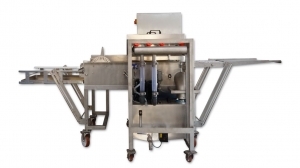 For a complete solution, all types of lye application are possible; it simply depends on your project goals. 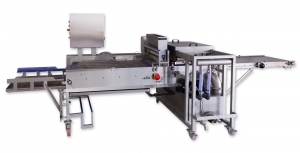 For automated processes, a so-called lifter can be used, which removes the dough pieces from the peelboard and carries them to the lye application unit and afterwards places them back on the sheets. This can be performed manually or automatically. 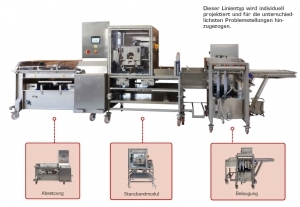 This production line showcases the combination options for pretzel production and can include a lye application unit, an intermedite proofer, an air conditioning cell, a freezer and a pre-packing stage. 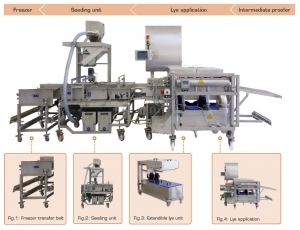 The lye application line where the products are automatically liftted from the peelboard, dashed with lye and set on trays. 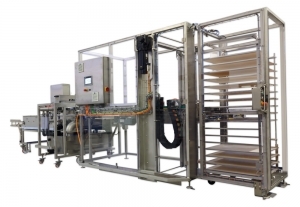 The tray unloading robot makes working with frozen dough pieces, among other things, considerably easier.